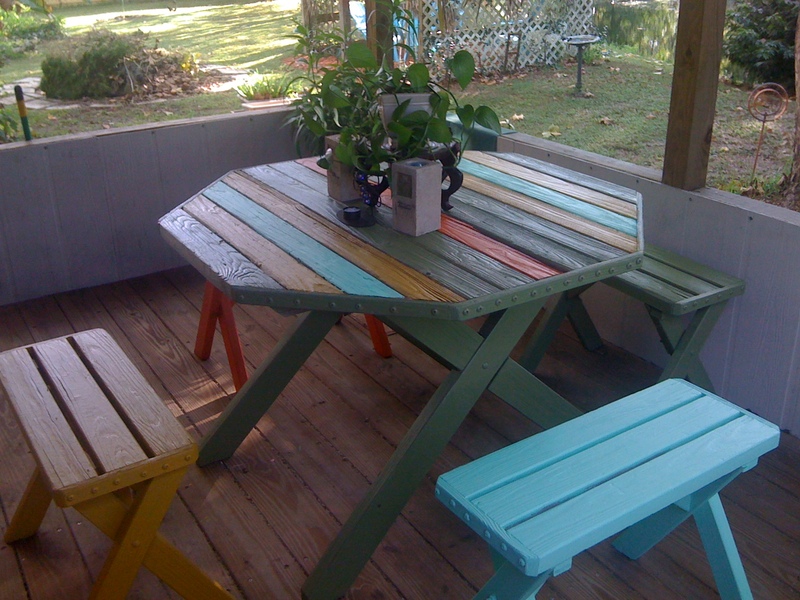 Yesterday afternoon I walked out onto my back porch and sat down at my hand painted rainbow-colored picnic table. I was loving the feeling of the way the air smelled so crisp and clean after the nice rain that had just passed. I could feel how happy all the plants and trees on my property were feeling, just as anyone would be after a nice cool glass of water on a hot summer day. 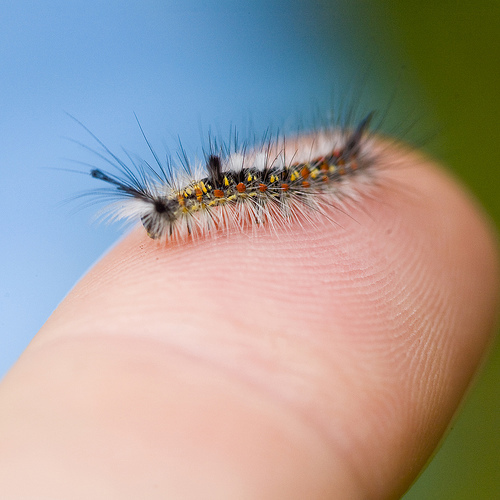 I gazed down upon the table, and noticed a little caterpillar that could not have been more than an inch long. As I just sat there observing him, I noticed that there was something odd about his movements. It was almost as if he was jerking his body. I looked a little bit closer and that is when I saw it. It was the tiniest spider I had ever seen. It could not have been bigger than a speck. No larger than a dot that I would make with a pencil on a piece of paper. I have to tell you, that tiny little spider was doing his best to take down that caterpillar, wrap him up like a doggie bag and snack on him for later. That’s when my maternal instincts set in. So I jumped up like mighty mouse singing,”.♪♫ here I come to save the day.♪♫!! !,” grabbed a leaf, whooshed the tiny spider away, and swooped up the caterpillar on that leaf like it was an ambulance bed , rushing him to the nearest and safest hospital plant , far,far, away, from mr. hungry spider. At least that was I thought. Please keep in mind that my perception of “far, far, away was on the plant in the doorway of my porch. Which I considered to be the equivalent of about one mile away, considering the size of the spider. Which truly was no larger than this dot. ( *). I sat back down watching the little spider running back and forth on the table. He was obviously and justifiably so, completely , and utterly annoyed with me. I begged for his forgiveness, pleading that I watched too many super hero cartoons as a child, and asked him to understand that it was just too hard for me to watch the caterpillar suffer. ( Yes, I talk to spiders too. 🙂 ) I went about my business for the rest of the day and never thought more about the experience I had just had. So tonight is a new evening, which is a whole day and half ‘s time from what happened yesterday with the spider and the caterpillar. Once again I walked outside, sat down at my hand painted rainbow table and I could not believe my eyes. There it was…the same little caterpillar in the same exact spot on the table, only 3/4 of his body was covered in a beautiful silken web. And there was Mr. hungry spider running circles all around him. As I sat there with my mouth open in amazement, I could not help but feel an overwhelming sense of gratitude in that moment. As I silently observed this awesome display of transition, the message I received was loud and clear. “There is a divine order of things to be .”… “Everything is as it should be.”… There is no need to struggle against the natural order of life, so except life’s moments with grace and courage.”!!! * When Paul McCartney sang “Let It Be”, he was right-on. * Mother Nature trumps all. * You are a kind-hearted, thoughtful person whose efforts were valiant. * We cannot fix everything for everyone, no matter how hard we try. * The caterpillar and the spider were destined to meet in life, in spite of the obstacles they were still drawn together for a purpose. Thank you for sharing. You are a true Superhero heroine. I knew that already, but this experience is a reminder. You are also a great teacher. Thanks for making me smile, Jules. This is a cute story!